Anyone for CGI – Iron, that is? Ripples through time, ripples of iron: Ailsa’s prompt gives me the chance to show another shot of Bage’s Flaxmill-Maltings, the world’s first iron-framed building and eighteenth century blueprint for the skyscraper. Recently, fellow blogger Frizztext in his post on Frankfurt Mainhattan spoke of “skyscrapers to sharpen the corporate identity”, a stunningly acerbic phrase, and Charles Bage certainly had something of the sort in mind when he built the flaxmill. The whole thrust of his design was to overcome a long-standing and costly problem for mill owners: the propensity of flax and cotton mills to go up in flames. There was certainly big money to be made in proving such a design. For one thing it meant industrialists could build bigger, taller factories, the better to exploit larger numbers of needy workers including orphans. 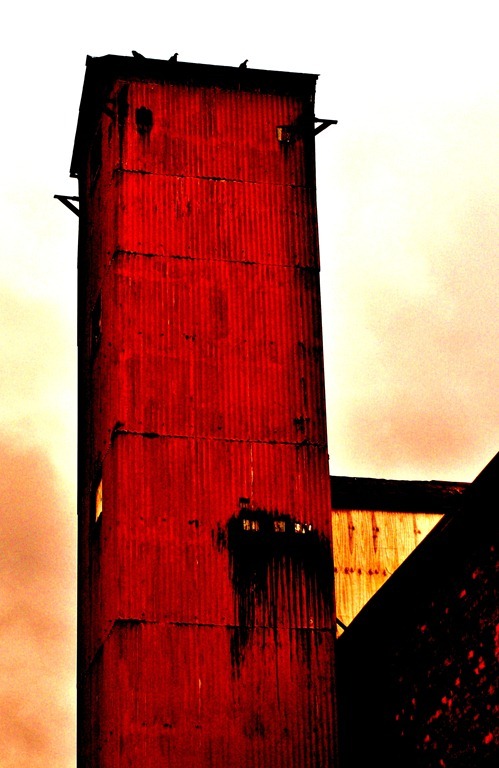 However, the iron-clad tower above (and whose rusty corrugations I confess to enhancing with some digital tinkering), belongs to the building’s later phase when it was used for malting barley for the brewing trade. I confess, too, to a yen for corrugated sheet iron. You could put it down to a childhood spent in rural Cheshire where the curved iron cladding of Dutch barns formed striking landmarks across the flat farmland. It was usually painted black. Corrugated Galvanised Iron is anyway a brilliantly useful structural material. It was invented in the 1820s by Henry Palmer, architect and engineer to the London Dock Company. 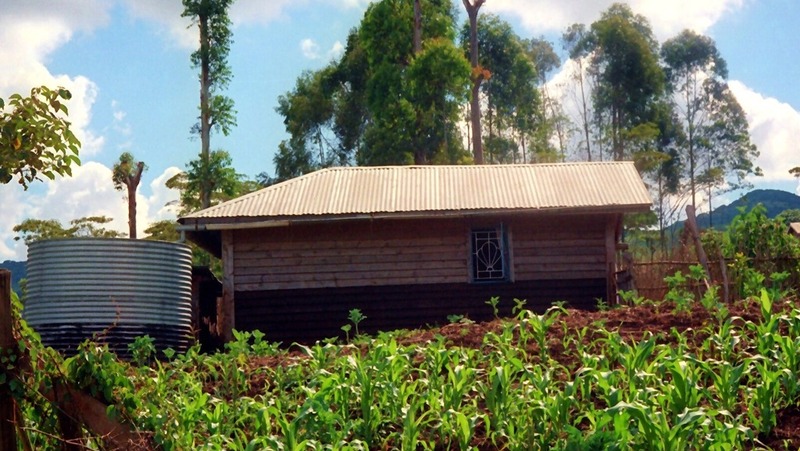 Cheap, and relatively easy to transport, it has been used all over the world to rainproof grass huts, make instant pioneer homes and water tanks, and to clad colonial godowns and administrative offices. One useful property is that it is pest proof. At least I think termites can’t quite manage to recycle it. It is ideal for prefabricated buildings, requiring little skill to erect. Furthermore, as it rusts, it creates its own art installations across the landscape. 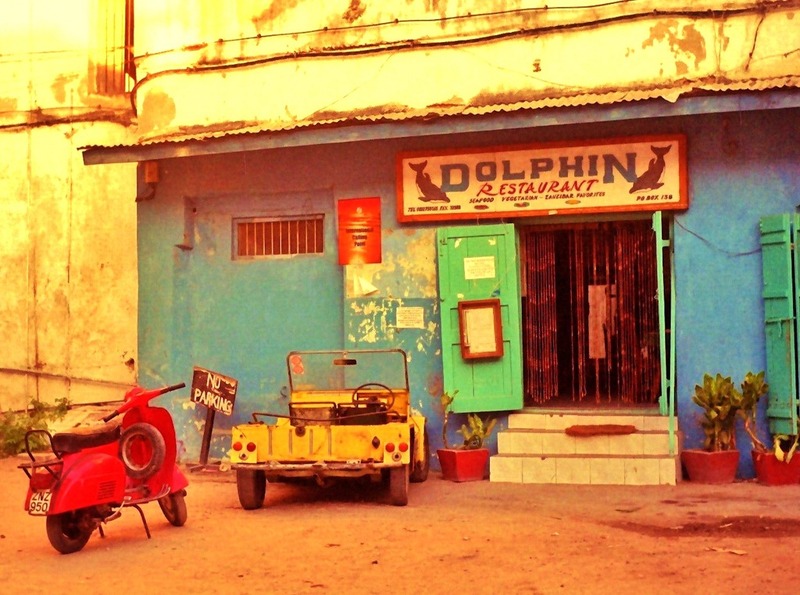 There are of course downsides in the tropics, rusting being one of them. 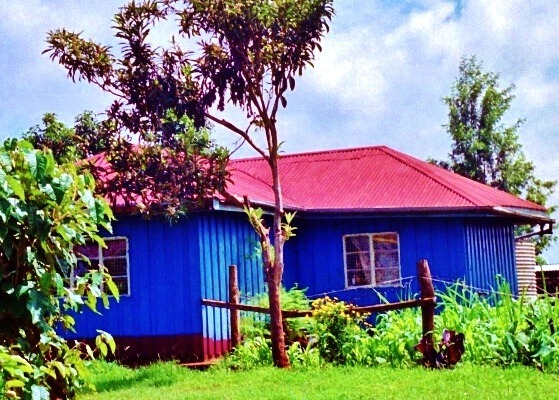 Also iron roofs convert buildings into ovens during the hot season, and into tin drums in the rainy season. I bet all you travellers out there (and especially those of you who live in Australia and New Zealand) have some good CGI shots too. Here are some more of mine. Click on the image to enlarge. This photo was taken blind (because the sun was shining on my camera screen), and on a happy snapper Kodak Easyshare. So I cannot take much credit for any of this. 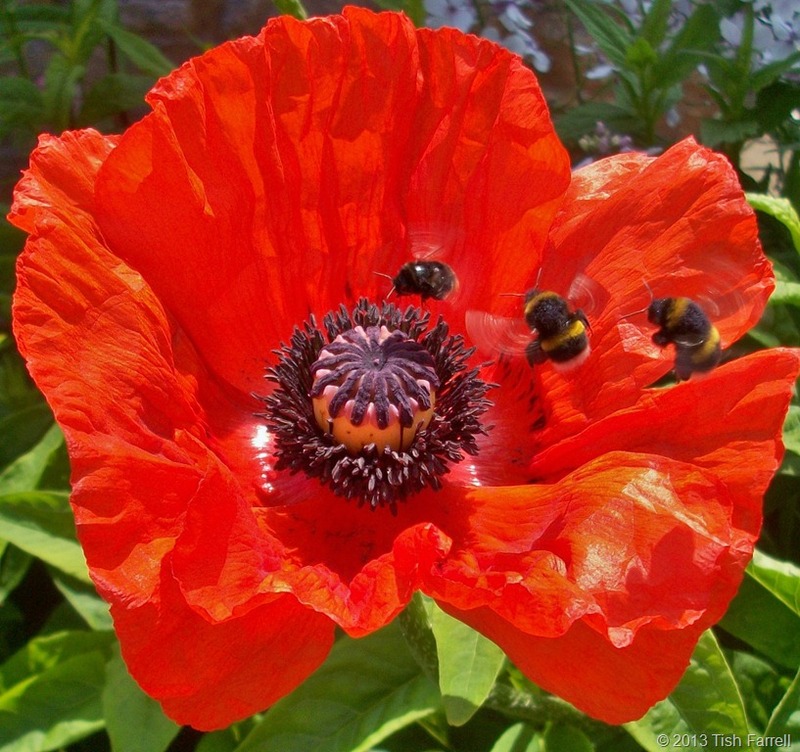 But isn’t it good to see so many bees, and especially after hearing of all the pesticidal threats to their existence. So a big cheer for the bees. We cannot live without them. Love the way you can see the fluttering wings. 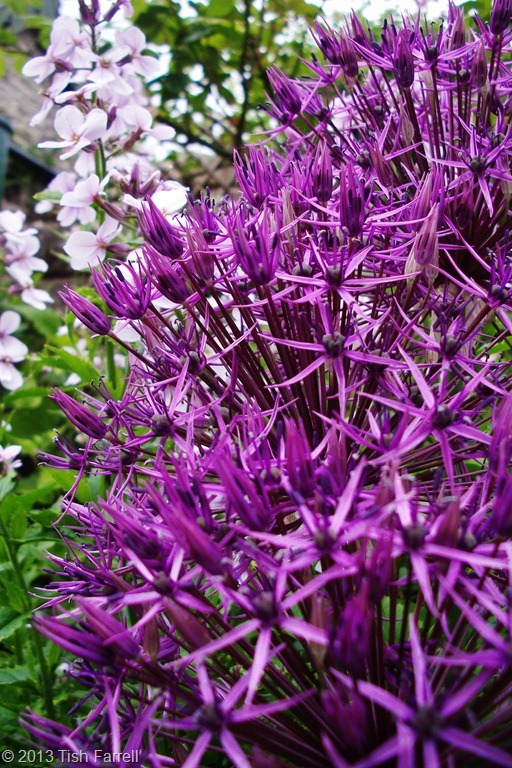 My writer’s mind, much like my garden, is often chaotic and full of weedy overgrowth. And so this morning, as a ready excuse not to tackle the former, I decided to go into the other weedy place in pursuit of something for the ‘A Word a Week’ challenge. I also thought I would try to overlook the fact that Sue, who set the challenge is very annoyingly enjoying tropical wonders in Malaysia while manfully coping with WFDS – wi-fi deficiency syndrome. Apart from which, this is just the other excuse I’ve been looking for to show off some of the rampant vegetation in my small but multi-level flowerbeds. So welcome to my garden on the Edge of Silurian Shores. 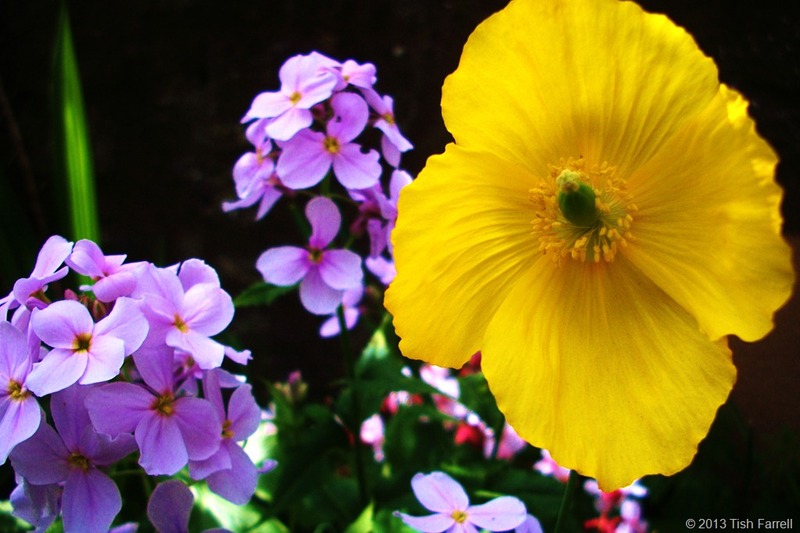 Wild stock and Welsh Poppy. 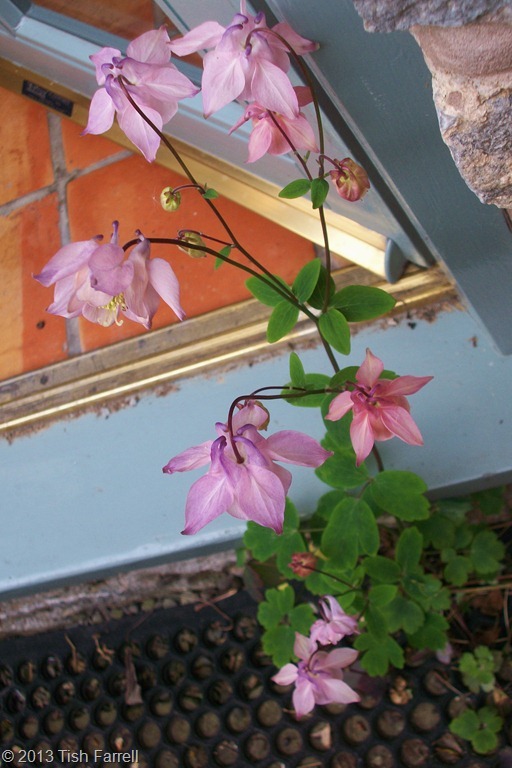 These came from my batty Aunt Miriam’s Devon garden. 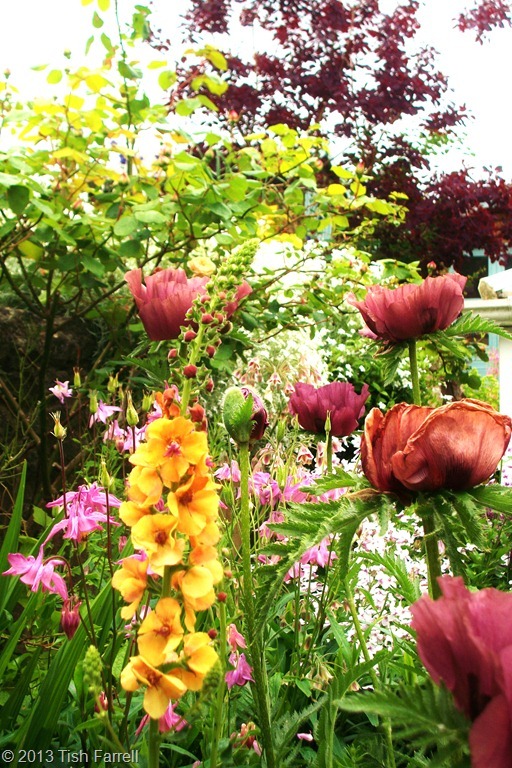 She is no longer with us, but doubtless is dead-heading and pruning and stealing cuttings somewhere in the big garden in the sky. 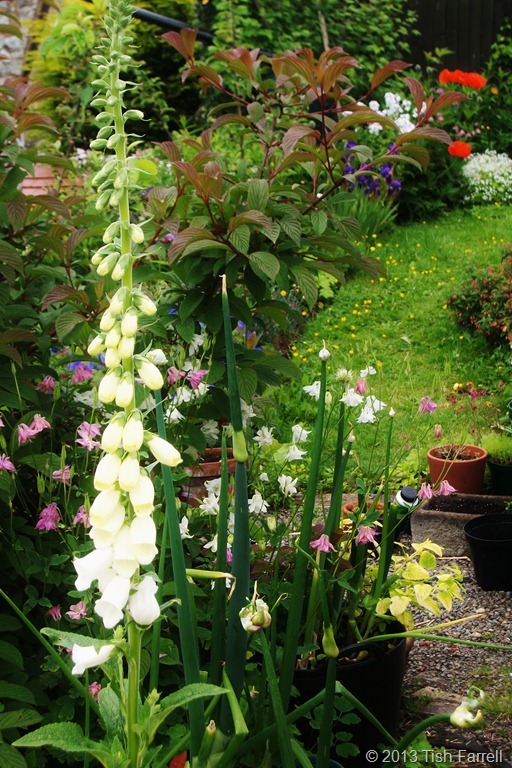 This white foxglove has grown itself in the path along with the pink and white columbine. I love plants that do their own gardening. 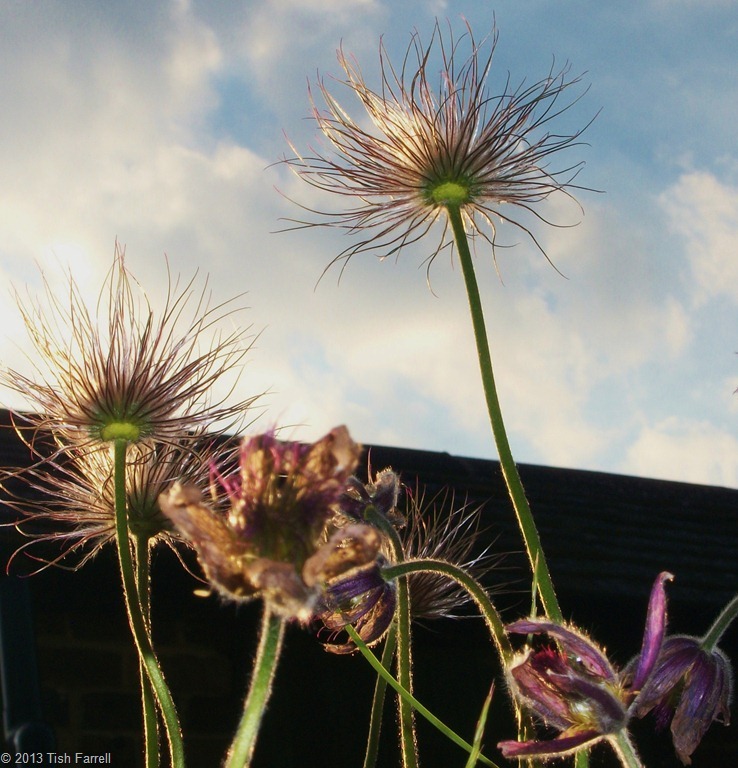 Pasque flowers going to seed at sunset – much like the photographer. 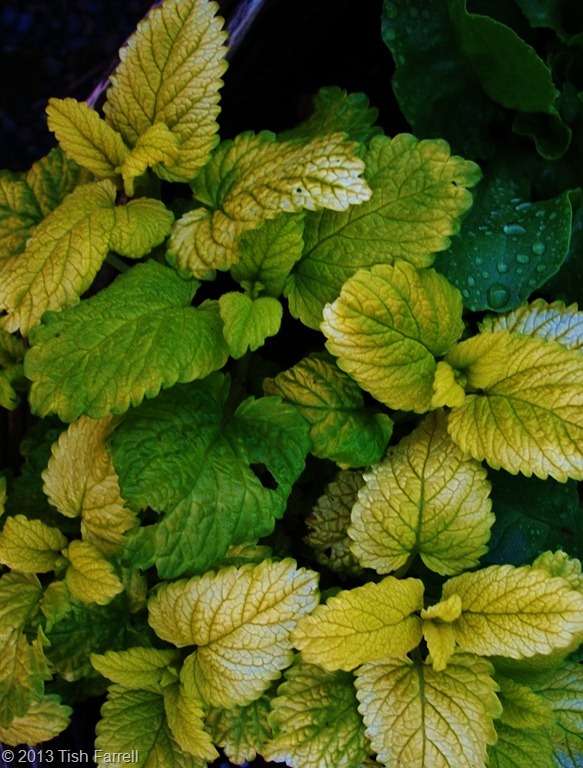 Variegated Lemon Balm not only smells delicious when you brush by it, but it makes a wonderful soothing tea if you are feeling stressed. Also good in Pimms and shredded finely on strawberries. Or in salads and tabbouleh. 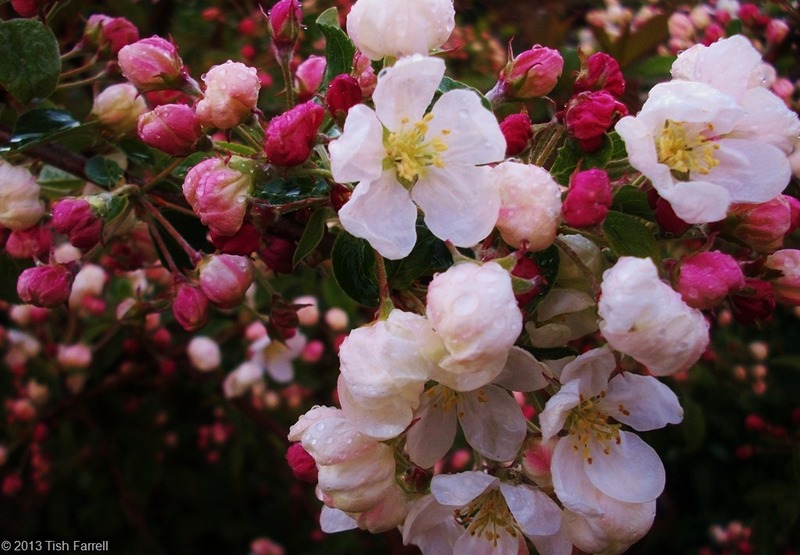 Japanese Crab Apple in bloom a few weeks ago. Already there are thousands of tiny apples forming. You can see what they look like in autumn here. Wonderful for crab apple jelly, and of course emergency winter rations for the black birds. The garden coming into the kitchen, though a certain amount of vigilance and exclusion must be deployed. Having suffered an invasion of leopard slugs on my counter tops and in the spaghetti, I definitely draw the line at all forms of molluscs coming in too. Townsend Meadow behind the garden and looking towards Wenlock Edge. For geology lovers this upthrust limestone ridge was once the bed of the tropical Silurian Sea i.e. c.400,000 million years ago. At that time this piece of ground was lying somewhere off East Africa. 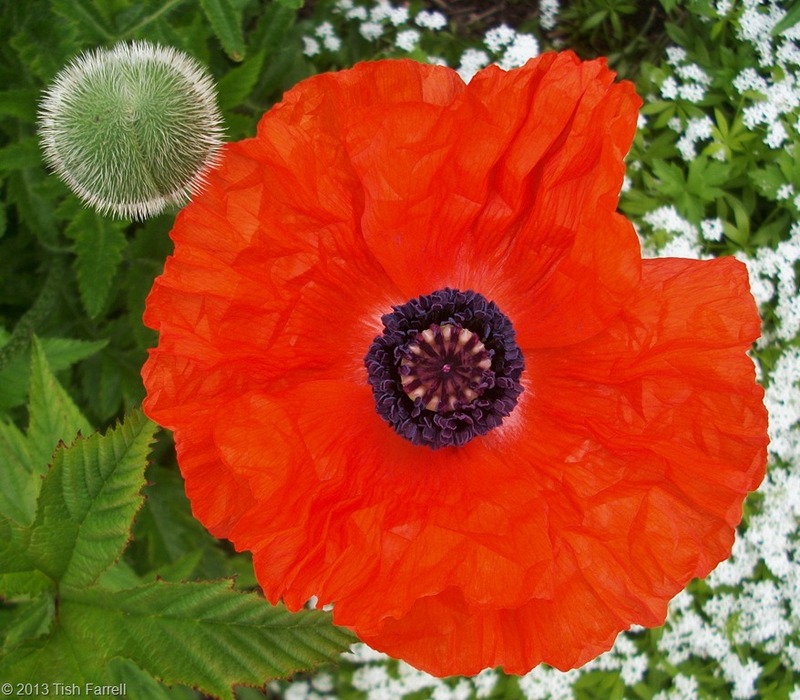 And because one look isn’t enough, another view of an oriental poppy, freshly opened, but not quite pressed. Finally, a Bee Movie. And for all those who follow Frizz on Flickr Comments, please note the sound effects. Don’t they remind you of something? The Great Earthly Curves Mystery: what, when and why? I could also throw in a ‘who ’ and ‘where’? So what’s your best guess on the identity of this marvellously curvaceous earthwork? No forward peeking. Here’s another shot. While you’re pondering, I should say that in a former life, in a long ago era that my knees think could well be the Lower Paleolithic, I studied Prehistory and Archaeology. That’s a clue. Okay. Here’s the whole thing. 1935 and 1937 aerial photographs taken by Major George Allen and in the possession of the Ashmolean Museum. Both images are in the public domain. 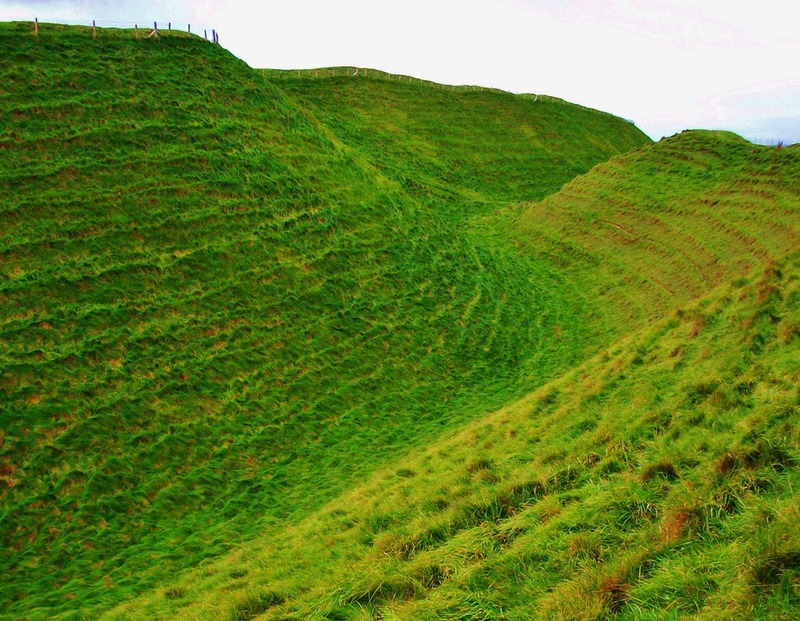 These, then, are the ramparts of Maiden Castle, one of Britain’s most famous Late Bronze Age – Iron Age hill forts. After two thousand years of wear and tear, the whole structure seems to have simply grown from the natural contours of the Dorset uplands. Of course when they were first excavated, with simple picks, incalculable people-hours, and much project management, the banks would have been higher still, and the ditches more sharply ankle-breaking; in their pristine state of freshly exposed chalk, they would have glistened white across the land and been visible for miles. And so in the past this place would have looked utterly magnificent, and other-worldly too, perhaps the equivalent of seeing a shimmering giant spaceship looming over the countryside; and perhaps that was the point. Or at least one of the reasons for its existence. This place was not only defensive, a signifier of tribal authority, but probably also the place of seasonal sacred gatherings, a place of pilgrimage in some sense. In fact a metaphysical aspect for this location is indicated across four millennia. The first human activity dates from around 4,000 BC when people of the Neolithic or New Stone Age built a prominently sited enclosure. The banks were low and hardly banks at all. Nor were they continuous, so it seems unlikely that it was made for defence. It appears to have been a place where people gathered for social and sacred reasons rather than in times of enemy attack. The burials of two children that were found there date from this time. Then around 3000 BC, after the enclosure was no longer used, a large ditched barrow was built. It apparently contained no burial, but may still have been a meeting place and important ritual landmark. Again, both the enclosure and the later barrow would have been bright white when newly made. Over three thousand years later, in late Roman times when Roman beliefs had fused somewhat with local beliefs, a small Romano-British temple was built there. In between, the site was used by Bronze Age farmers who left behind traces of their fields, then around 600 BC the first hill fort was constructed. At first it was much like the many other hill forts that were being built at this time across Britain. 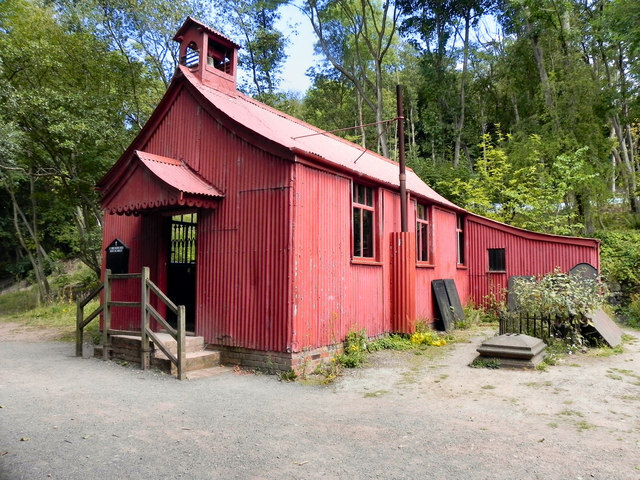 It was not especially impressive, and enclosed around 6.4 hectares (16 acres). But around 450 BC it underwent a massive expansion, involving the enclosure of two hill tops. The defended area increased to 19 hectares (47 acres) which, the English Heritage guide tells visitors, is equivalent to 50 football pitches. Also at this time the defences became very complex, and the banks were raised to a height of 8.4 metres (28 feet). In other words, it was an extraordinary feat of engineering and manual labour. It was a statement of power, capacity and authority. It was a place that people looked up to in every sense. 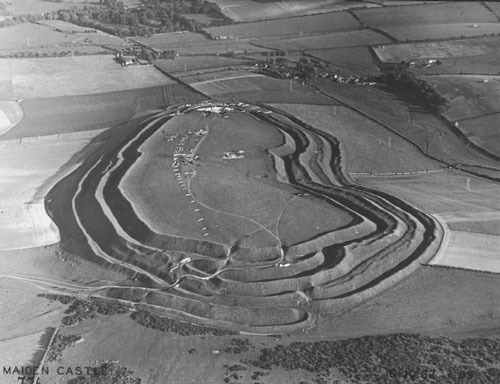 Maiden Castle is also unusual is that, unlike many other hill forts, there is evidence that people lived there. These people were the Celtic Durotriges. 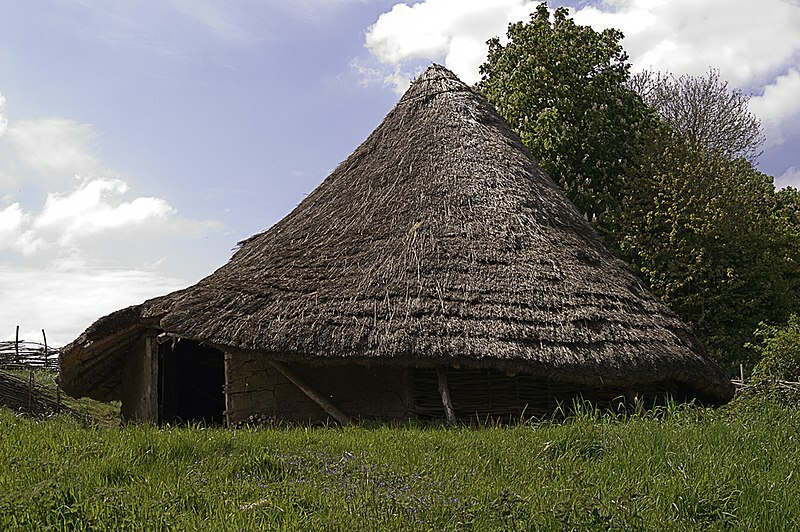 Excavations have revealed that they lived in thatched round houses, grew wheat and barley which they stored in granaries and kept sheep, pigs and cattle. Doubtless they would have had horses for transport and oxen for ploughing. Iron was worked on the site. Then there were the piles of round stones, strategically placed around the fort. These were probably used for slingshot, and suggest that an attack was expected. It appears, too, that the expected siege did take place. During the 1930s excavations of Maiden Castle, Sir Mortimer Wheeler uncovered part of a cemetery. Of the 52 bodies excavated, a number showed signs of a violent death. This, Sir Mortimer concluded, was evidence of an attack by Vespasian’s legionaries during the Roman invasion of AD 43. 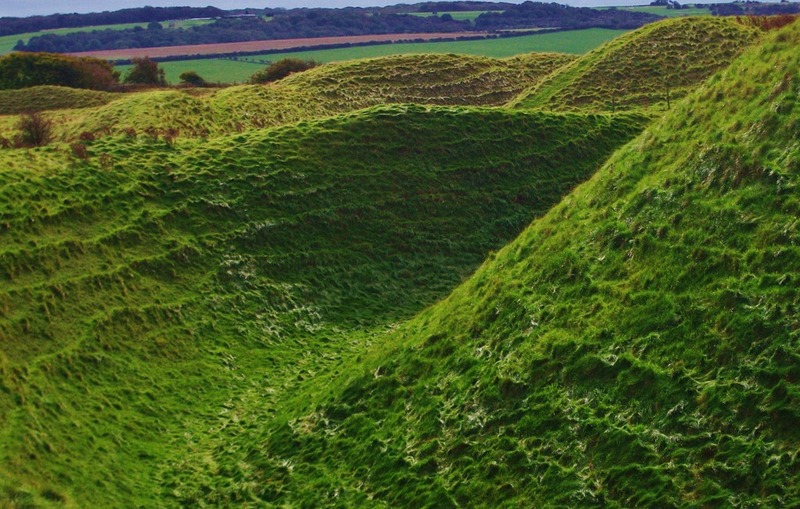 In 2009, a burial site with 50 decapitated bodies was discovered not far from Maiden Castle during road building, and according to Roman historical accounts, Vespasian conquered some 20 hill forts across the Durotriges’ territory. By the time the Romans arrived, Britain had long been a prosperous country inhabited by a number of different Celtic tribal groups. It was not a backwater as we might imagine. The Romans, after all, were coming for a reason, not out of idle curiosity. For two hundred years before the invasion, Celtic traders had well-established markets in Europe. 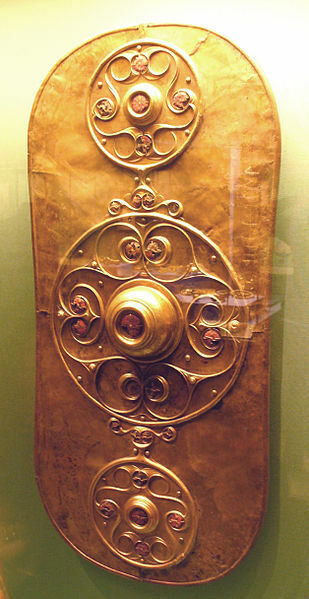 Iron Age Shield found in the River Thames at Battersea Bridge, London. Photo: Creative Commons, Wikipedia. Their inlaid gold-, silver- and ironwork was exquisite (and endlessly curvy) – torcs, brooches, shields, swords. They made fantastic weather-proof felted capes. They exported surplus grain from the numerous farmsteads whose traces still remain across Britain’s landscape. They sold slaves, and hunting dogs. In return, they imported amphorae of olive oil and wine, amber and ivory jewellery. It was a moneyed economy. 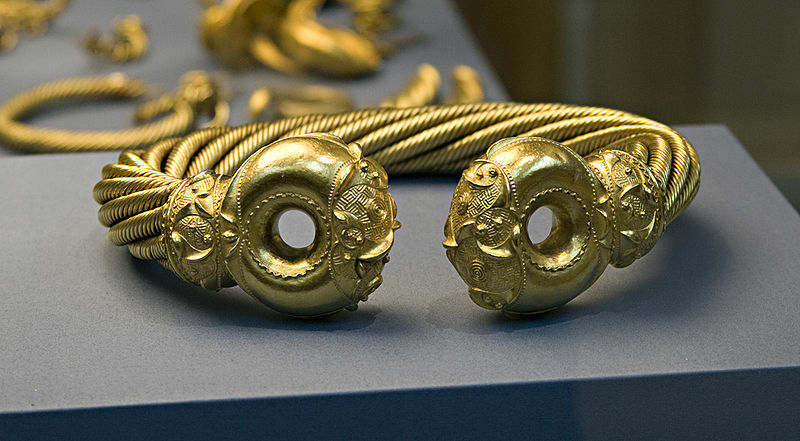 Gold torc from the Snettisham Hoard, Norfolk. Photo; Creative Commons, (Wikipedia). Below is an example of a Durotriges gold stater. 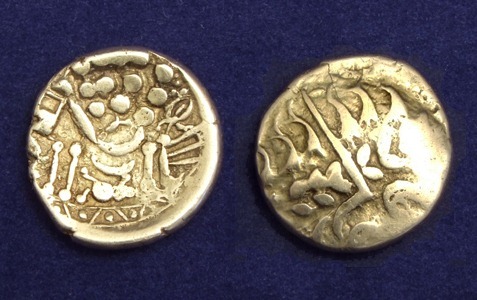 Coin experts point out that it shows an abstracted Celtic version of the head of Apollo (left) and a dismembered horse (right). The finds of such coins have been used to plot the extent of Durotriges territory – that is, from East Devon, across Dorset, and including southern Wiltshire. By AD 70 they had become Romanized, and were part of the Roman Province of Britannia. The process of urbanizing the Durotriges occurred, then, not at Maiden Castle, but down on the banks of the River Frome at what is now Dorchester. During this time the hill fort was apparently abandoned, and not apparently used again until the building of the 4th century temple. But to come back to the curvy earthworks and their purpose. 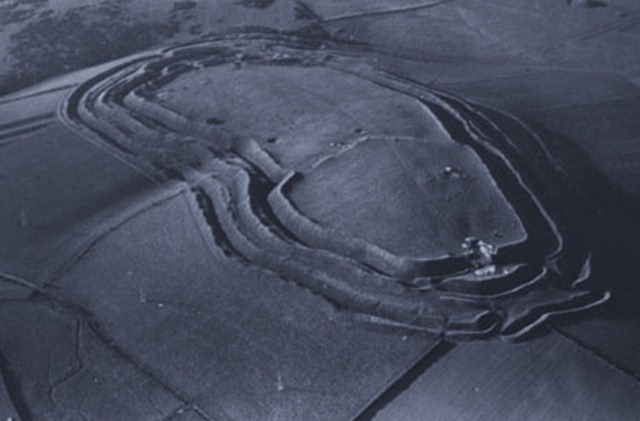 Many archaeologists have argued that hill forts of Maiden Castle’s scale and impressiveness belong to the category of defensive tribal strongholds known as oppida. These are found across Europe – from Spain to the Hungarian plain. In other words, they could be described as proto-towns. Yet this notion of incipient urban development does not fit the the hundreds of British hill forts that show absolutely no sign of permanent occupation, nor of warfare for that matter. Because there is one BIG disadvantage to occupying a hill fort for any length of time, and that is access to fresh water. The need to bring it in makes the occupants highly vulnerable in all sorts of ways. All that can be said with certainty is that these structures were of huge importance to the people who built them. The effort that went into their construction, the periods of rebuilding over several centuries tells us this. We can also surmise that the cultures who produced them were prosperous and highly organised. Building these hill top structures required people-power, and from a population who mostly lived elsewhere in defended farmsteads. The building of them could only happen when there was no demanding farm work, probably between planting and harvest time, when digging conditions were favourable. But then if the Celts were known to trade in slaves, then presumably they also had their own. Perhaps these impressive monuments were built by slaves? Another thing that we often make mistakes over, is that non-industrialised people do not, and probably never did, divide up their reality into strict divisions of sacred and profane as we do. All reality is sacred in some sense. From our position of self-appointed technologised loftiness we often refer to such belief systems as ‘superstition’, while engaging with our own spirits of consumption in shopping malls and coffee shops. 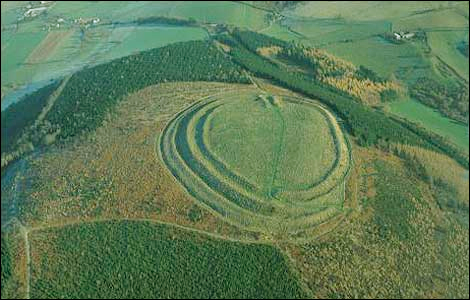 But if people did not occupy these hill forts permanently, then for practical purposes, whether as defensive retreats or the meeting place for the seasonal ceremonies of scattered Celtic clans – the need for a striking location that everyone could find would be paramount. A place where beacons could be lit and seen for miles, where raw rock ramparts would float in the sky like a mirage. 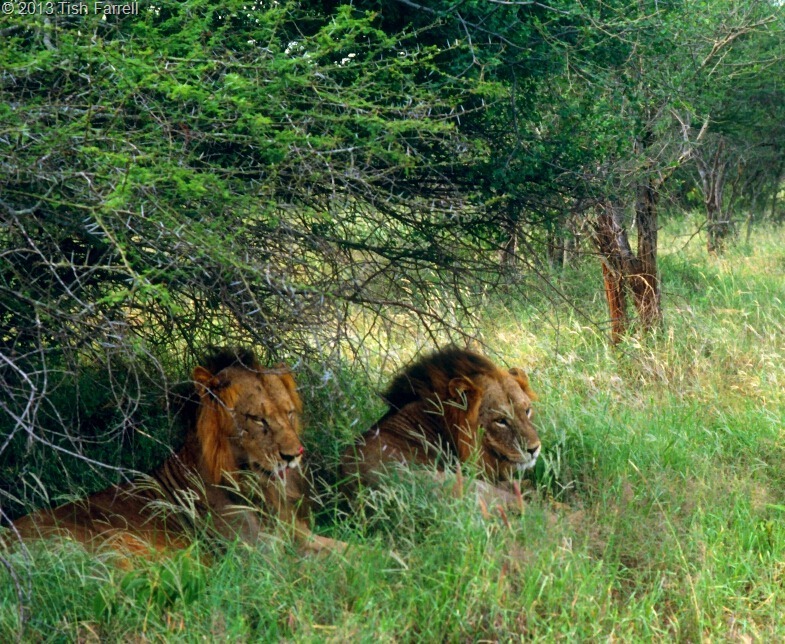 Perhaps there was indeed a need to feel secure from enemies and wildlife while serious rituals were being conducted. But then high banks may also be used to contain sound as an amphitheatre does – the chanting of storytellers, the pronouncements of seers and leaders. Also a hilltop is closer to the spirit world, to God, the Creator, to Heaven; it is a place half way between the mundane and the sublime. And just because a sacred thanksgiving is going on, it does not exclude the possibility for horse trading and dowry negotiation, or for storytelling contests and trials of warrior strength, or displays of obedience from hunting dogs. So: the great earthwork mystery remains largely unsolved. Perhaps it does not matter. When we visit such places we know they are special; if we allow ourselves to respond, that is enough. With that thought in mind, it is fitting to end with a literary connection. Maiden Castle of course loomed large on the creative landscape of Thomas Hardy, famous son of Dorchester. 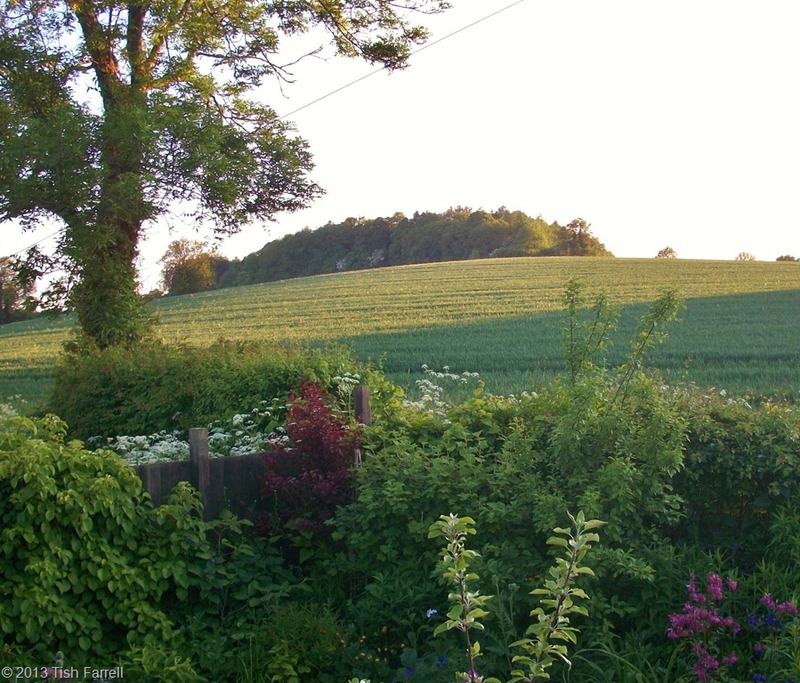 In the Mayor of Casterbridge, the hill fort provides a dramatic setting where would-be lovers seemingly meet by chance. You could say that both this image and the survival of its medium (old film) is fleeting. The original photo was taken from a passing Land Rover on a dirt road. As you can see, I’ve been playing about with it. But it struck me, too, that there is a deeper meaning here. Life can be all too fleeting in the non-industrial world, and especially on bad roads. See for instance Jujufilms , a blog that shows both the dark side and wondrous vivacity of Nigerian life. But this reminds me of another kind of disaster. 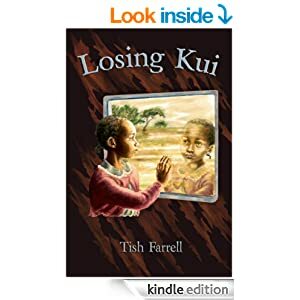 When Team Farrell was living in Zambia in 1992-3 there was too much dying going on – from famine, TB, malaria and cholera. And then there was one especially tragic event that touched all Zambians. Our passing connection with it began when we did something that we have never done since – we went to a football match. On 30th January 1993 Zambia was playing Namibia in the World Cup qualifying round at Lusaka’s Independence Stadium. 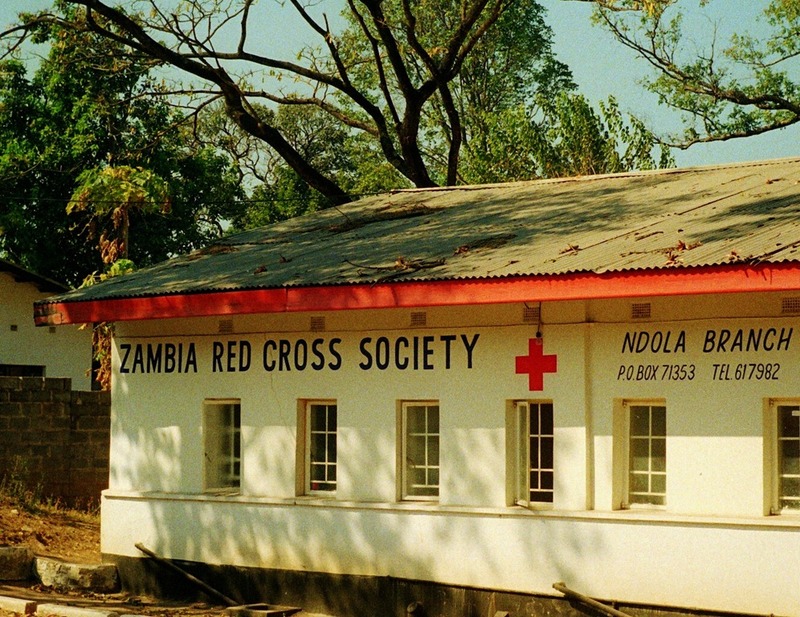 The reason we were in Zambia was because in November 1992 Team Leader, Graham, had been seconded from the Natural Resources Institute, Kent, to the EU Delegation in Lusaka to manage the distribution of European food aid to upcountry Zambians. There had been a bad drought in southern Africa during that year, and President Chiluba, who had recently succeeded Kenneth Kaunda in the first multi-party elections since Independence in 1964, did not trust his ministers to distribute the maize flour and cooking oil fairly, or even at all. Instead, he said, international donors were to use Missions and NGOs to reach the starving villagers. And so this was Graham’s own mission – organising food deliveries to far flung corners of the Zambia. Famine, though, was not the only problem at that time. There were guerrillas from Mozambique spilling over Zambia’s remote eastern borders to predate on poor villagers. Then from the north came the unpaid members of Mobuto’s Zairian Army. To make up for a lack of salaries, they would drive down into the Copper Belt, or even as far as Lusaka, for a spot of night-time looting and pillaging. (It will be remembered that Mobutu was another dismal world leader put into power by Western governments). Last but not least, Son of Kaunda, doubtless suffering the loss of the family power-base, was plotting a military coup. All seemed precarious, then, a situation made much of by British-born locals and EU diplomats who never tired of telling us of their hair-raising confrontations with rapacious gunmen stealing even their curtains, or how our Suburu would surely be car-jacked if we were silly enough to drive into the city. Going to a football match, then, suddenly took on an element of foolhardiness. It was one of Graham’s colleagues, David Walker, visiting Zambia for a short stint of crop storage consultancy, who said we must go. And since his enthusiasm was so infectious, go we did, although it took much persistence to get tickets; none of the European Zambians had any idea how we might buy them; nor could they imagine why we would want to. It was Wilfred, the EU Delegation’s driver who told us when and where to go for them. And so, come match day, on a hot Saturday afternoon, we set off in the Suburu that was ‘bound to be car-jacked’. Independence Stadium is a little way from the city, out on the Great North Road. There were no signs, only two brick gateposts in the middle of nowhere. We simply followed the trucks and pick-ups jammed with excited fans, and the thousands and thousands of pedestrians. 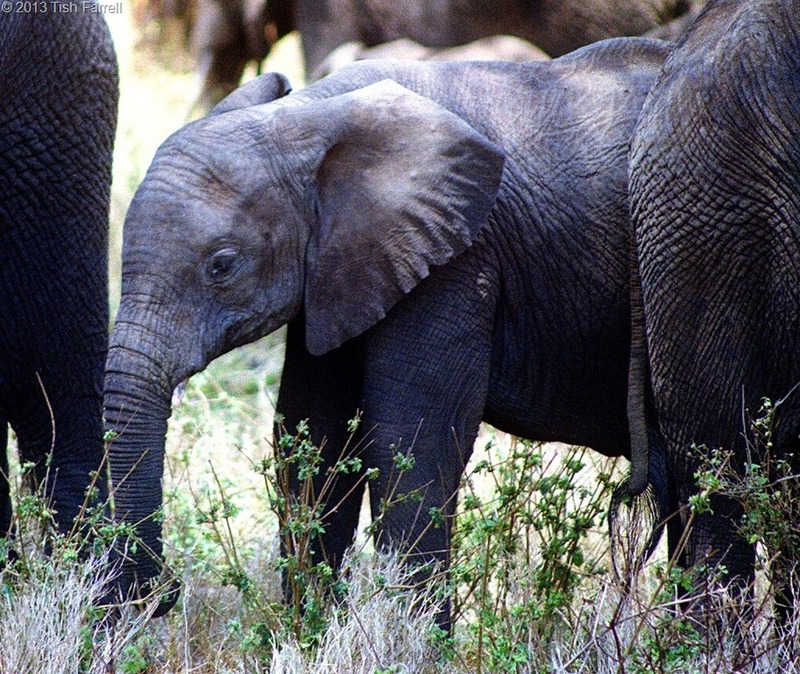 It was a real family outing – mothers, fathers, children, alert but placid babies tied to their mamas’ backs. When it came to parking, Graham soon struck a deal with two boys to ‘guard’ the car. A young police woman politely asked if, Madam, could she see what I had in my basket, and briefly explored our picnic. Soldiers checked our tickets. And as the ugly concrete stadium filled, the Namibian team entertained the crowd with a synchronized warm-up to rhumba rhythms. The only dint in the general good humour came when a Zambian team official began to announce line up changes over the PA system. The whole stadium groaned. “Now just listen!” said the official in the manner of a thwarted school teacher. And everyone did, while he spelled out the reasons for the substitutions. At five minutes to kick off, the presidential motorcade swept round the ground, releasing the diminutive President Frederick Chiluba in front of the grandstand to greet the teams. The military band struck up the national anthems, the President was installed in his executive armchair, and the TV camera woman atop her scaffold was ready to roll. Zambia needed four goals to qualify. There was a general air of speculative optimism: was it too much to ask? But fifteen minutes in, with the first goal scored, everyone was certain. Their heroes would not fail. This was the team that had thrashed Italy 4 –0 at the 1988 Seoul Olympics. This was the team set on winning the first Africa Cup of Nations trophy. They were going places, taking with them, Zambians’ highest hopes. The match won, the fans left quietly. We returned to the Suburu that had not been car-jacked, and paid the boys their kwacha. Leaving by car, though, was not so easy. We found ourselves locked in a vast sea of humanity. As we slowly edged forward, people rested their arms on the car window sills in a companionable way, exchanged a few words with us. Finally, a kind policeman waved us out onto the Great North Road where we joined the dash of fan-filled trucks, the smelly old bus that was transporting the military band back to barracks, and finally the Zambian team bus, that pulled alongside before overtaking. “My God!” Graham cried. “We’re in the procession.” We gave the team a cheer. It had been a thoroughly good-hearted afternoon. Three months later the entire Zambian team was dead. On 27th April they were on the way to play Senegal when their plane crashed off Gabon. We had been out of the country when it happened, and returned to a nation that had had the stuffing knocked out of it. President Chiluba declared a week of national mourning. 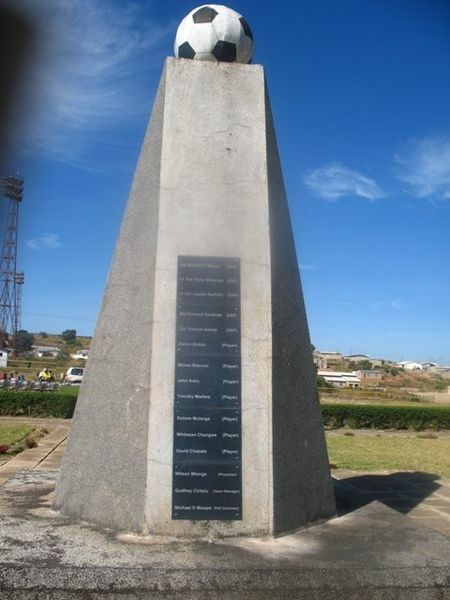 The radio played only funereal music and, on the 3rd May 1993, Zambia’s team and Zambia’s hopes were buried in state on ground near Independence Stadium. The tens of thousands of people who attended wept. The President wept – real tears, not like the ones his predecessor was wont to weep. And so the building of a new team became a touchstone for the greater struggle of building a new nation. I thought of the man who had danced his joy and shaken our hands, and wondered how he was. Cool Britons that we were, we had not asked his brother’s name. Now, twenty years on, Zambia is a nation on the up, and when the Zambian people finally receive the full value of the mineral wealth extracted from their land by international companies, they will surely do a lot better. But when it comes to the 1993 disaster, the families of the dead team and air crew still do not know why the crash happened. The aviation report is yet to be released. Somehow it means the grieving just keeps on going. Okay, I confess. I’m using Ailsa’s weekly photo challenge for a piece of shameless self-publicity. Because today I’m feeling anything but peaceful. I’ve just heard that my short story ‘Flight’ won third place in the International Bath Short Story Award, sponsored by Writing Events Bath. Of course it’s set in Africa as most of my fiction is. To read ‘Flight’, follow this link then scroll to the foot of the page. Twelve of this year’s short- and longlisted stories are to be published by Hearst as an e-book anthology under a new imprint UkEditBooks in November. So all you fiction writers out there, seasoned or novice, submissions for the 2014 Bath Short Story Award are OPEN 1st November 2014. Go for it! 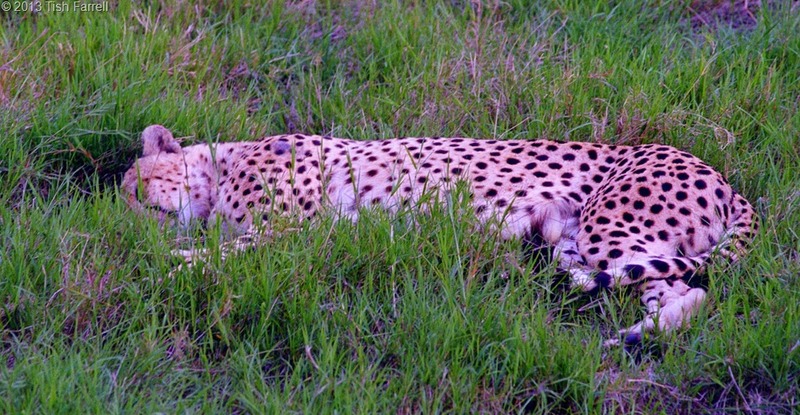 Now to calm things down I’m posting some shots of some very languor-inducing wildlife. 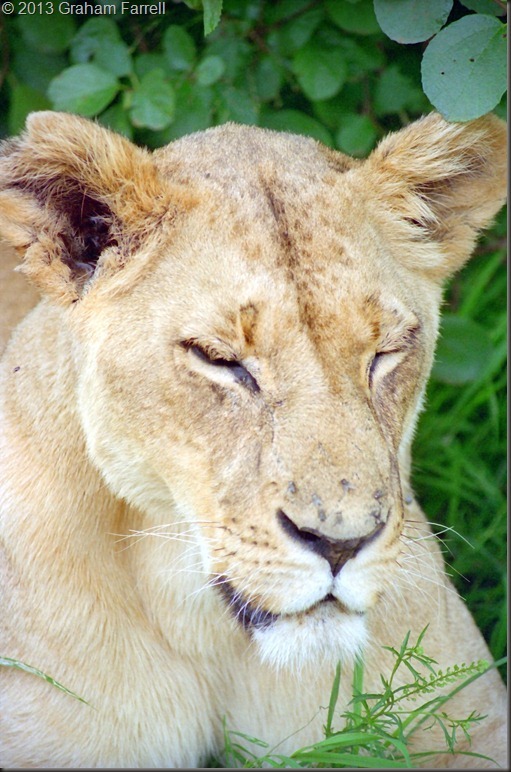 Besides which, big cats do ‘laid back’ like no other, and quiet small elephants are a joy to behold on any occasion. And as for Grevy’s Zebras composing themselves so stripily, what else is there to say but ENJOY! 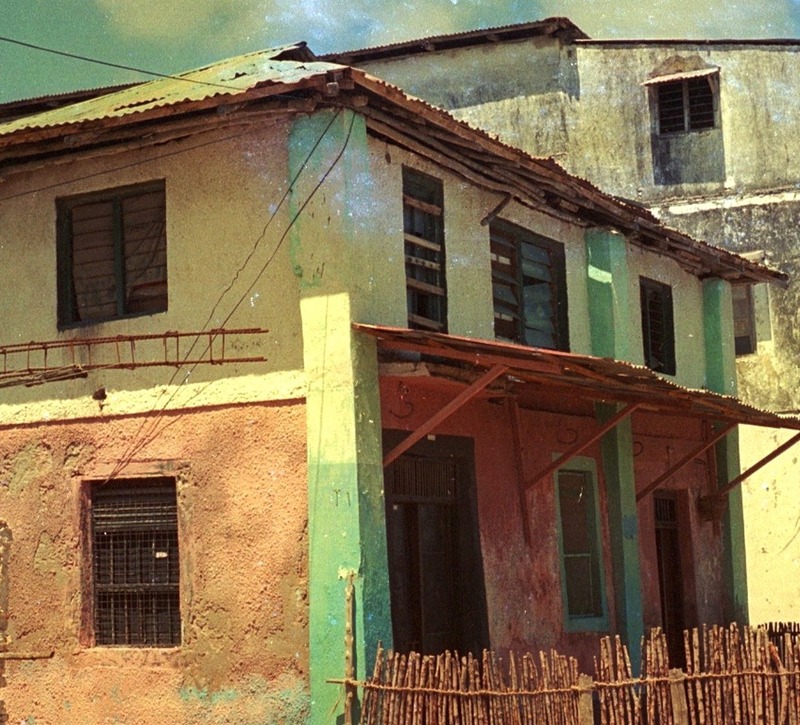 My scanning of old negatives from Kenya and Zambia days in the 1990s is an on-going task – both tedious and oddly compulsive. Sometimes I hit the batch scan button so I can hoover or iron at the same time. Once in a blue moon I look up from such a task to find that a particularly striking image has materialized on the screen – something I had forgotten entirely. To see it again is almost shocking. This was such a photograph. In some ways I wish I had not taken it. The location is the Outspan Hotel in Nyeri, Kenya, and the subject, a performer, dressed in the manner of a Kikuyu medicine man or mundu mugo circa 1900 when European ethnographers and missionaries began to take photographs of Kenya’s peoples. 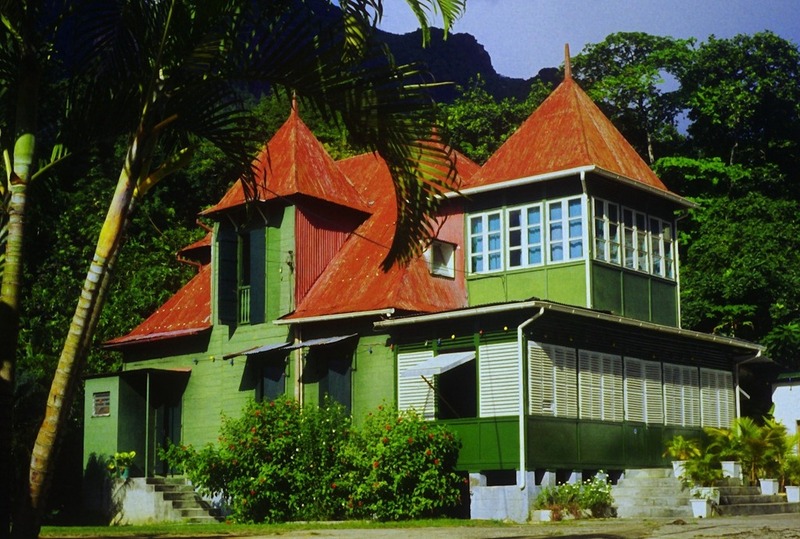 The Outspan itself is also a colonial construct, built by Major Eric Sherbrooke Walker in 1928. 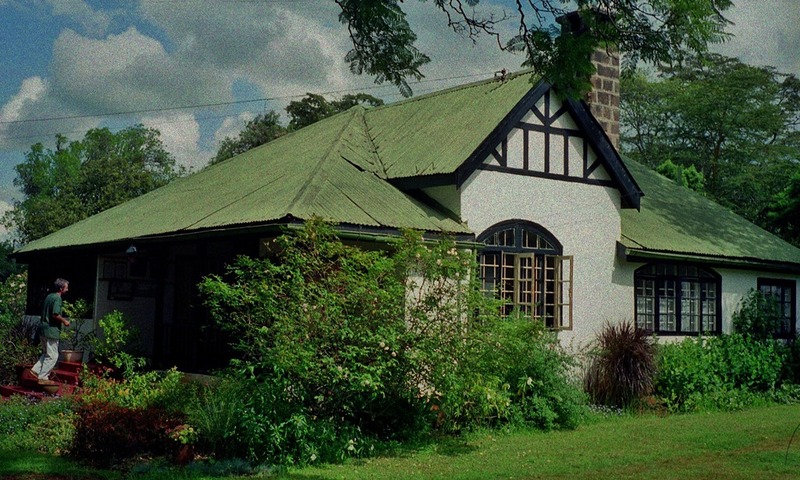 He later built Treetops, a small game-viewing lodge a few kilometres away in what is now the Aberdares National Park. In the beginning this truly was a tree house, complete with a platform overlooking a waterhole. It was here, in 1952, that a safari-ing Elizabeth Windsor learned that her father, George VI, was dead and she was now Queen Elizabeth II. Not long after this, freedom fighters in the predominantly Kikuyu-led Land and Freedom Army (generally referred to as Mau Mau) burned Treetops down. Today its successor is an imposing affair, several storeys high, but still looking out on the waterhole where game comes to drink at dawn and dusk. The two hotels are on the standard tour bus itinerary. Visitors are bussed up from Nairobi to the Outspan for lunch, and in the afternoon they transfer to Treetops. For their entertainment in between there are performances at the traditional Kikuyu village in the Outspan’s garden. The intention is that the visitors will learn something about the human locals before they spend a sleepless night watching out for elephant and leopard at Treetops’ floodlit waterhole. For most of the day, then, the village is shut, hidden behind a bamboo screen. It comprises a couple of thatched round houses, a granary and a blacksmith’s workshop. The place only bursts into life after lunch when a troupe of young dancers, wearing the polite and thus fully clothed version of traditional undress, put on a brief but lively song and dance show. As one of YouTube’s videos of this show indicates, some of the audience completely misunderstand what they are seeing and think the performers are real villagers who actually live in the thatched round houses. In consequence, they marvel at the dancers’ good English, despite the fact that English is Kenya’s official language. Context, as they say, is everything, and it is perhaps not surprising that such confusions arise. What is real and what is not? What is authentic and what is concocted from cherry-picked elements of a little remembered past? Even born and bred Kenyans may ask this question of the bizarre circumstances that often arise in a country where multi-cultural idioms too often collide. 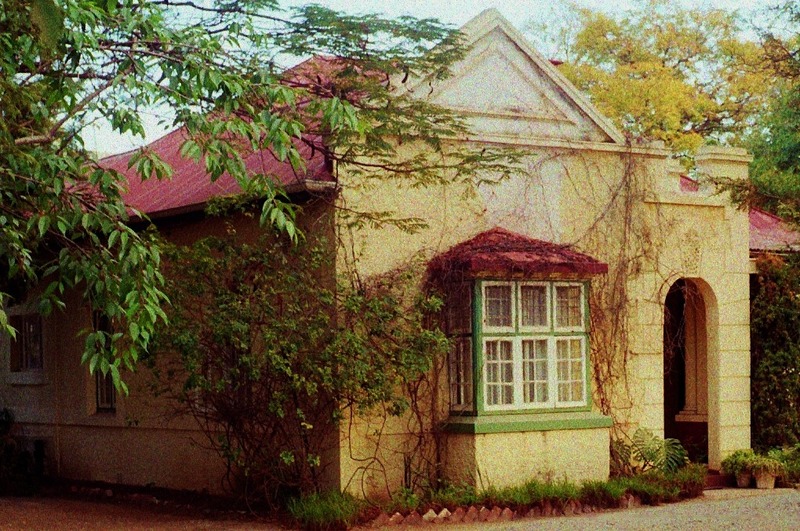 After the singing and dancing, visitors may look around the village houses while the young performers try various ways to part them from their cash. The inevitable curios appear. I say, No thank you. I live in Nairobi. A young man grins and suggests that I might like to give them money for beer. A girl hushes him. I begin to suspect that some of them are already a little high. I say kwa heri and move away. And it’s then that I see the old man, perched on his elders’ stool. 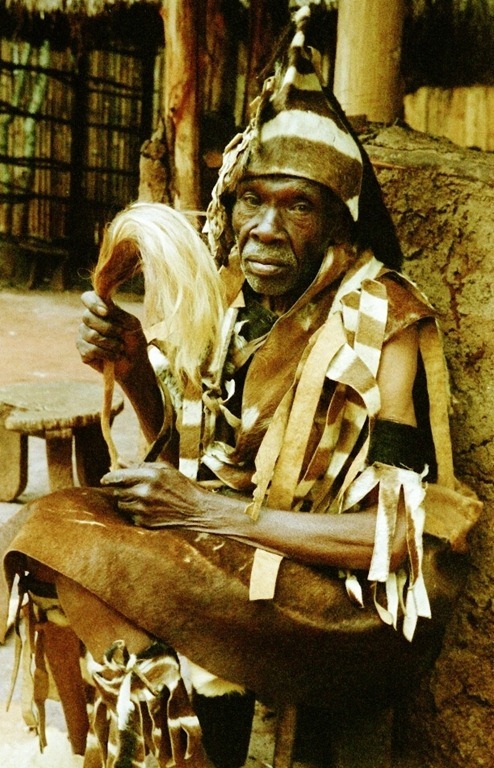 At his feet, on a goatskin, are the trappings that suggest the medicine man’s profession. I greet him in the customary way: Hello mzee, how are you? But he does not respond, either to my words or to my presence. This is quite extraordinary behaviour for a Kenyan. The exchange of common courtesies at every meeting – whether with friends or strangers – is de rigeur. At first I conclude that he doesn’t speak Ki-Swahili, but only Kikuyu. Then I wonder if this is all part of his role play. Medicine men and women were august individuals who once wielded great sacred and psychic authority; they would be above casual chitchat with the likes of me. Finally it occurs to me that he might once have been a real medicine man, but can no longer practise his trade. Then I do the tourist thing and take that photograph. So why does it still worry me all these years on? Why do I find the Kikuyu Village experience, beyond its light entertainment value, so distasteful? In some ways the whole thing is well meant, and whatever tourist resort you go to in Kenya there is likely to be ‘the traditional dancing slot’ at some point, usually between the hot buffet lunch and the game drive. Nationally too, much store is set by remembering the old songs and dances, and every afternoon on Kenyan television there would be performances by school children around the country. After all, songs and dances are, like the story-telling tradition, a strong part of any culture’s identity. But then do they work outside the context that gave rise to them? Do they still have intrinsic meaning beyond the exotic outward show for tourists’ delectation? Perhaps I am only offended by my impulse to want to photograph everything – look, snap, move on; another form of plunder? Perhaps that old man’s withdrawn, sad look more than pricks my conscience. But then perhaps he also feels ashamed of what he does to earn a few bob every day? Might not pretending to be medicine man bring its own form of psychic retribution? I suppose it comes down to respect. This man looks old enough to remember the last vestiges of his people’s ‘elder days’ before colonial rule finally changed everything. He probably grew up in a house like the ones in the Outspan village. Most likely he would have been born on a Native Reserve, euphemistically referred to as African Land Units. These were demarcated in the early 1900s by the British colonial administration, ostensibly to protect native territories from encroachment by future European settlement. This was especially necessary for the Kikuyu of Central Province. They occupied prime land in the cool highlands that were thought the ideal place to settle by the white pioneers who lived in mortal fear of the sun’s actinic rays and thus had to wear flannel layered spine pads and solar helmets to protect themselves. Even so, the Kikuyu lost out. When the reserves were being surveyed, the population had been decimated from small pox and famine, and the survivors had fled to relatives in the north. The unoccupied lands quickly returned to bush, and so were deemed virgin territory by the land surveyors. When southern Kikuyu families at last returned to their homesteads they found their land taken by British would-be coffee farmers. This was one of the issues that fuelled the 1952 uprising, this after King George had failed to deliver the justice that Kikuyu elders thought their heartfelt letters to him would surely yield. Now I suppose this piece is timely for two important events. The first is that the sixty year reign of the British sovereign who became queen while she was in Kenya is now being celebrated. 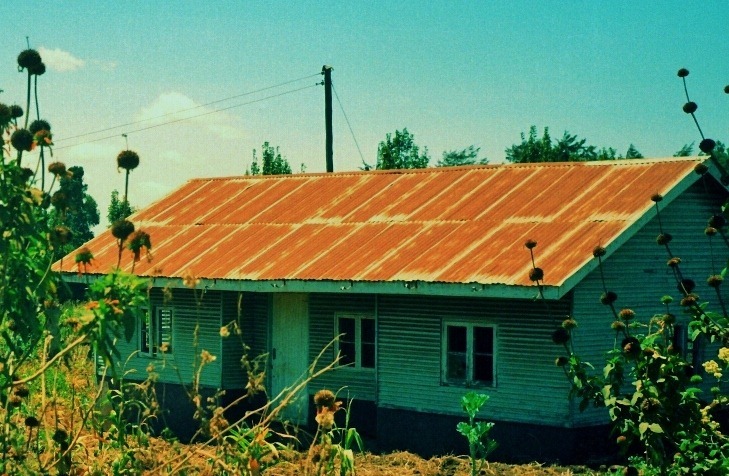 The other, and to me, more important news is that the British Government has just apologised to the Kikuyu victims of the 1950s colonial detention camps, with each of the 5,000 complainants receiving around £2,000 in compensation for torture and mutilation. Most were imprisoned without trial. And so perhaps finally what this portrait of the old medicine man is telling me is, that all too often we rich, technologized northerners are too ready to judge by appearances, the outward trappings of costume and regalia, and thus come to all the wrong conclusions. We have done this since we arrived on the African continent. I do not know this mzee’s true story, and in a way that seems typical of much of the industrial world’s relationship with the people of the Africa. We tell our own stories in which they feature, but we rarely want to know what really happened. Perhaps it’s time we asked. We might learn something to our advantage. 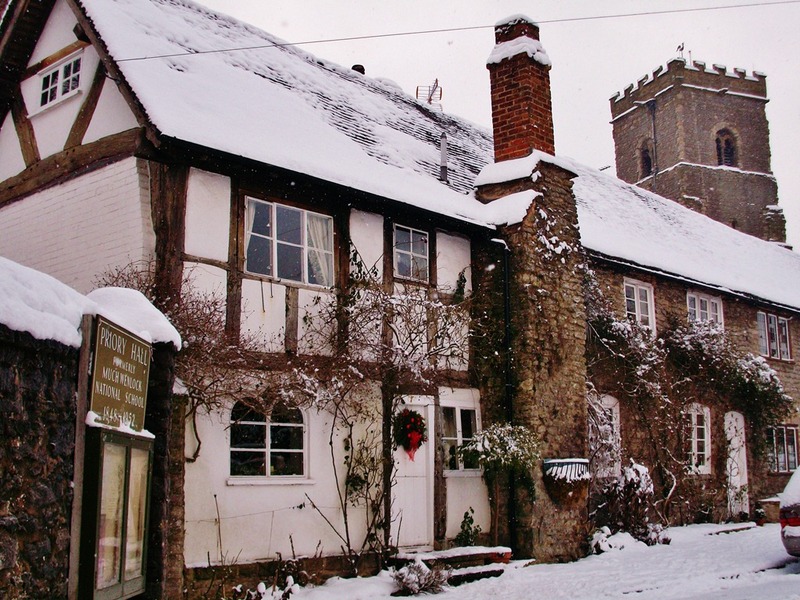 Here are some scenes of the town where I live, Much Wenlock, a settlement continuously lived in for the last thousand years. For more of its history see my post Of Silurian Shores. The town grew up around a medieval monastery. 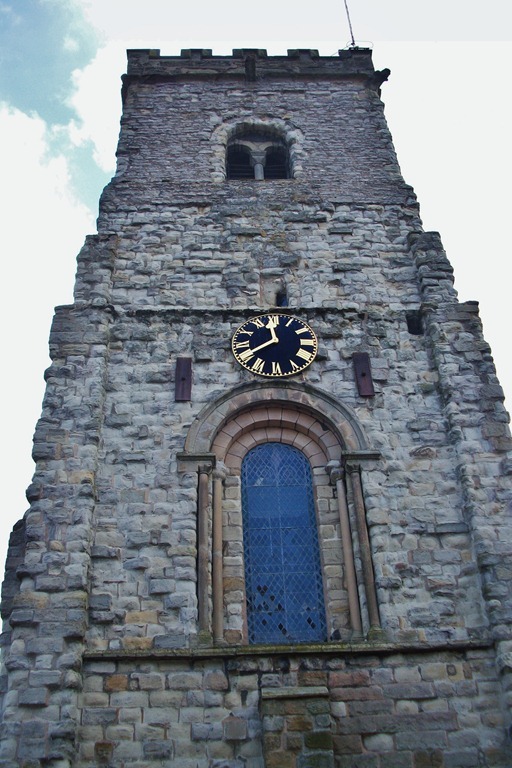 This is the tower of Holy Trinity church which survived Henry VIII’s Dissolution of the Monasteries in 1540. It has been our parish church since around 1100 AD. Originally it was part of the monastic complex. 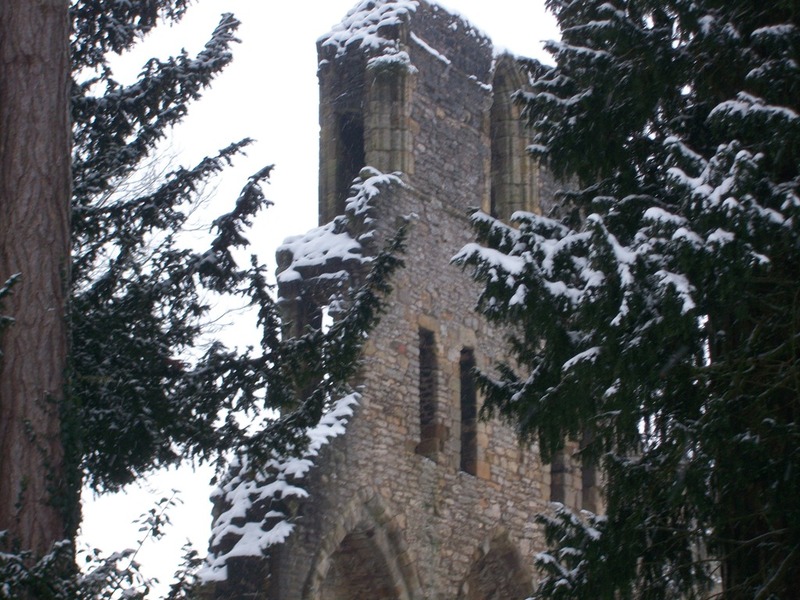 The Priory ruins are now owned by English Heritage. This twelfth century Cluniac Priory was once one of the largest religious houses in Europe. It was built on the site of a much earlier abbey founded in the seventh century by St Milburga, daughter of King Merewald of Mercia. England’s Norman rulers wished to cash in on the sanctity of St. Milburga’s remains as well as making a big architectural statement on the Saxon landscape. This is street is called The Bullring, once the place for bull-baiting, a popular local sport until the early 19th century. 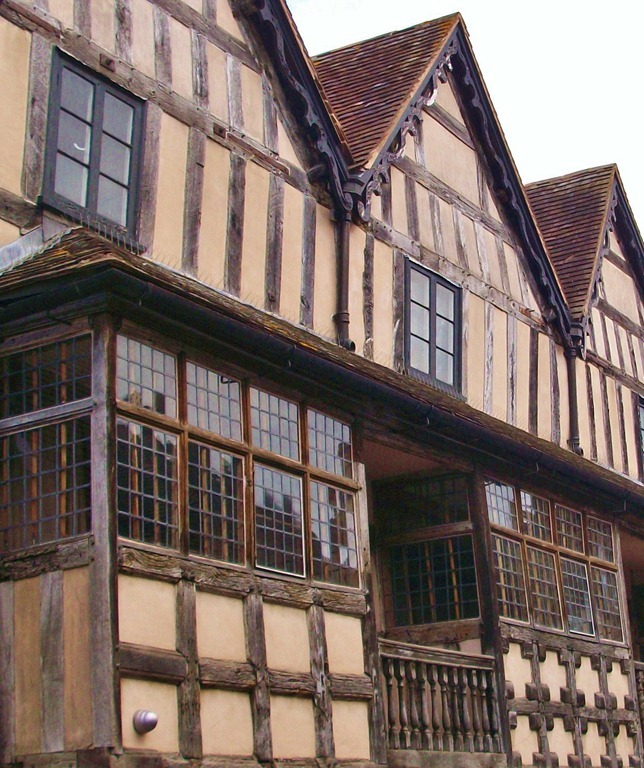 The Guildhall was built around 1540 as the court house to replace the monastic court after the Dissolution. Town Council meetings are still held here. The ground floor is used for various markets. 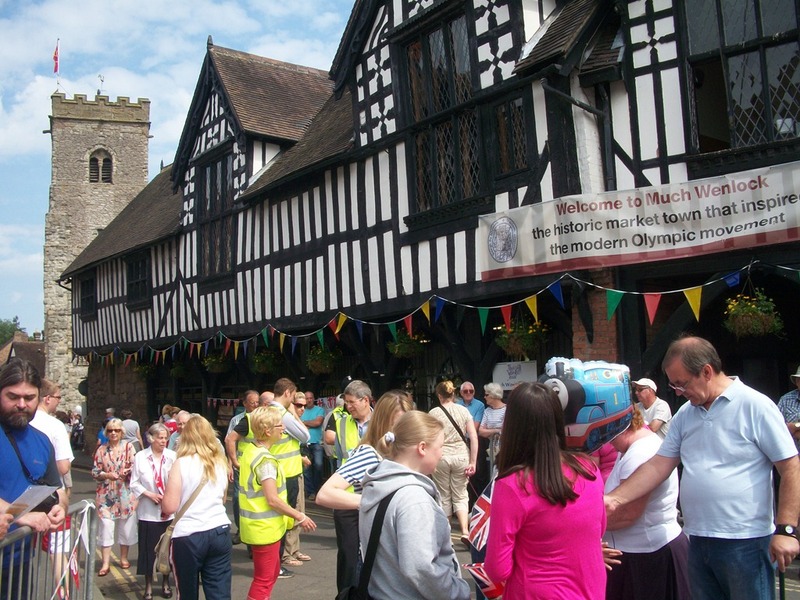 In this photo, taken in 2012, townspeople are celebrating Much Wenlock’s Olympic Games connections. See Of wolf farts, windmills and the Wenlock Olympics. 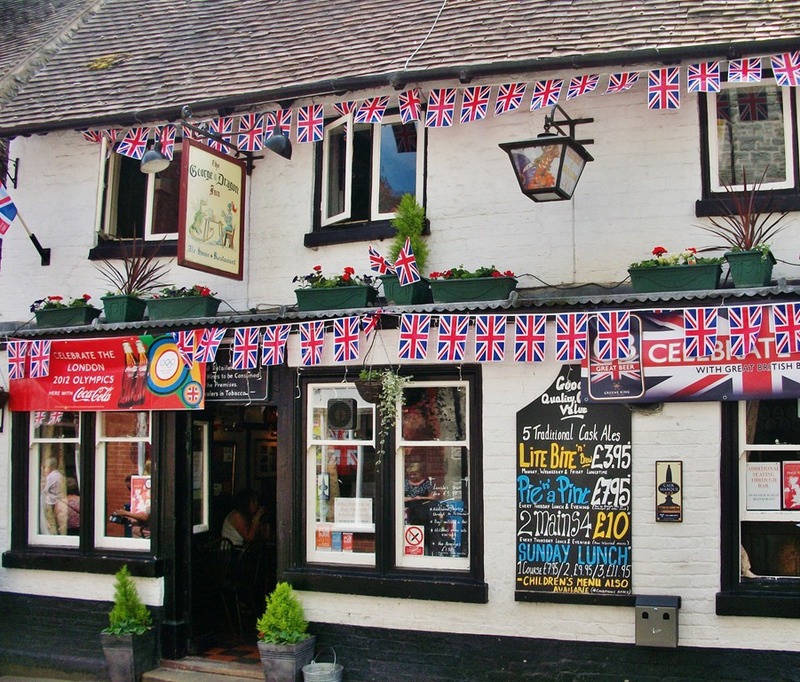 The George and Dragon is one of the few survivors of the town’s once numerous inns and public houses. The town’s main industries were limestone quarrying, lime burning and agriculture – all hard-working pursuits guaranteed to build up a thirst. 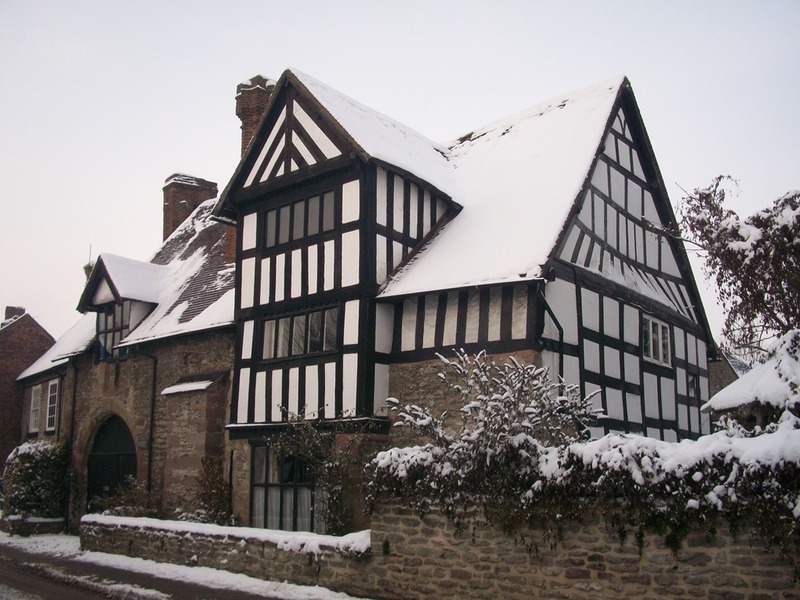 Raynald’s Mansion (above) on the High Street dates from around 1600. 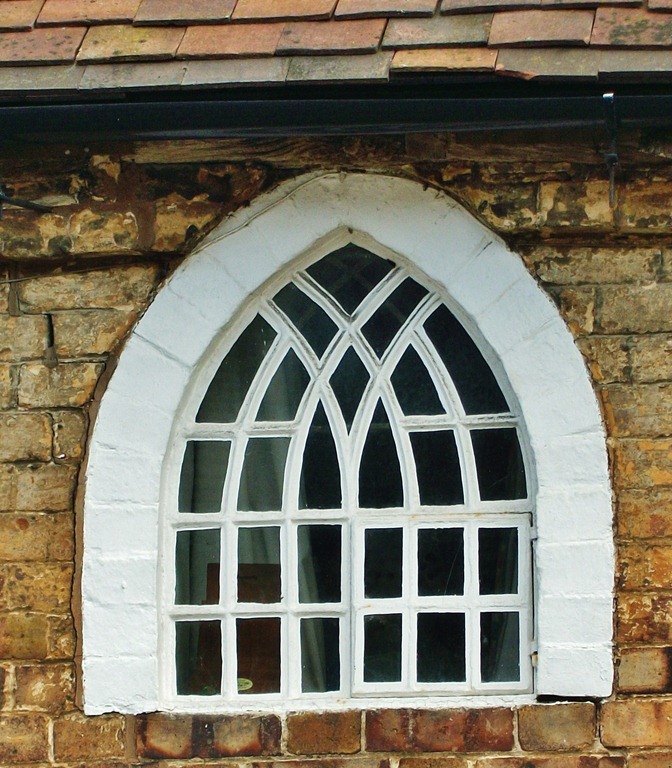 These ogival windows are a local ‘speciality’. 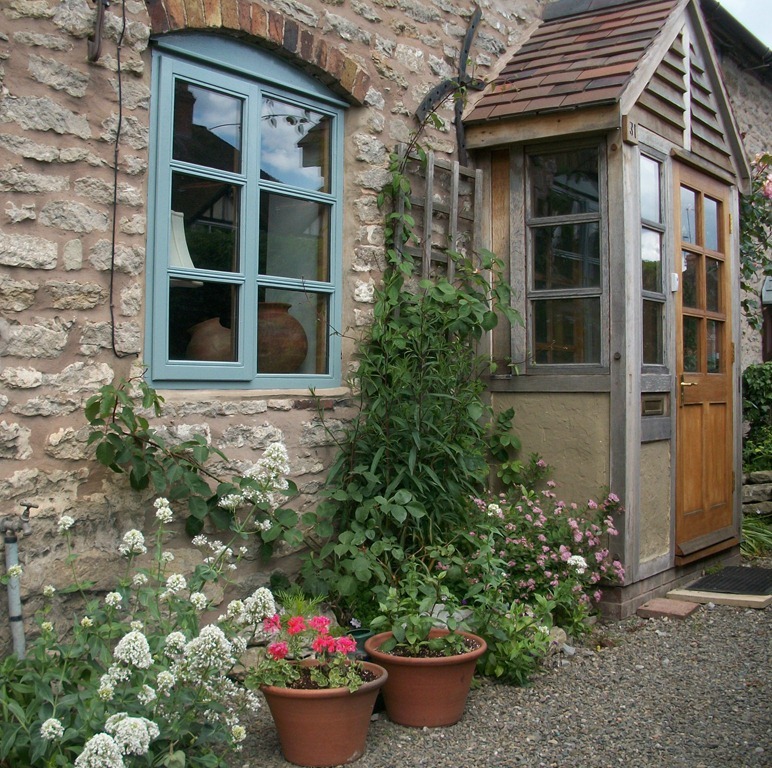 And some of my windows. 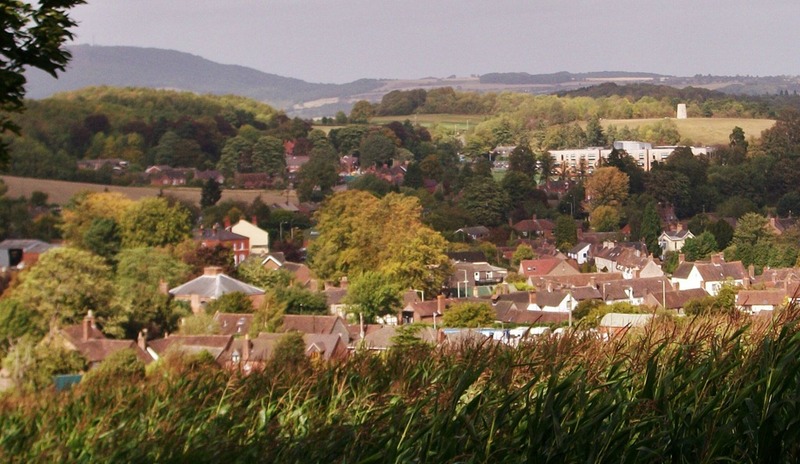 Looking down on the town from the south west, Windmill Hill top right, The Wrekin top left.